Rotating waves are a fascinating feature of a wide array of complex systems, particularly those arising in the study of many chemical and biological processes. With many rigorous mathematical investigations of rotating waves relying on the model exhibiting a continuous Euclidean symmetry, this work is aimed at understanding these nonlinear waves in the absence of such symmetries. Here we will consider a spatially discrete lattice dynamical system of Ginzburg–Landau type and prove the existence of rotating waves in the anti-continuum limit. This result is achieved by providing a link between the work on phase systems stemming from the study of identically coupled oscillators on finite lattices to carefully track the solutions as the size of the lattice grows. It is shown that in the infinite square lattice limit of these phase systems that a rotating wave solution exists, which can be extended to the Ginzburg–Landau system of study here. 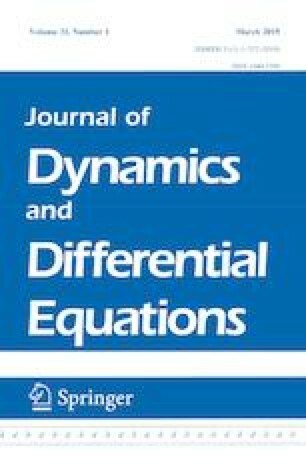 The results of this work provide a necessary first step in the investigation of rotating waves as solutions to lattice dynamical systems in an effort to understand the dynamics of such solutions outside of the idealized situation where the underlying symmetry of a differential equation can be exploited. This work was supported by an Ontario Graduate Scholarship while at the University of Ottawa. The author is very thankful to Benoit Dionne and Victor LeBlanc for their careful reading of the work, correcting errors and making improvements to properly convey the results.